Apps · Let's Go Amerks! Introducing the very first and only application that will deliver news and information about the Rochester Americans right to your phone for FREE!! If you’re anything like me you’re hooked on your smart phone and always looking for the latest news and information. The app is ad supported to make them free but the ad’s are not annoying, they just take up a small part of the bottom of the screen. The application is also very small in size and will not take up a lot of storage space on your device. If you own an Android or iOS device you have to download the FREE application that will push new articles from this awesome web site to your device! To download the free application just go into the Android Market or Apple App Store and do a search for Amerks or click the links below. Once you download and install the application open it and the first time you do you will be prompted to enable alerts. When you enable alerts anytime a new article is posted you’ll get a notification on your device! 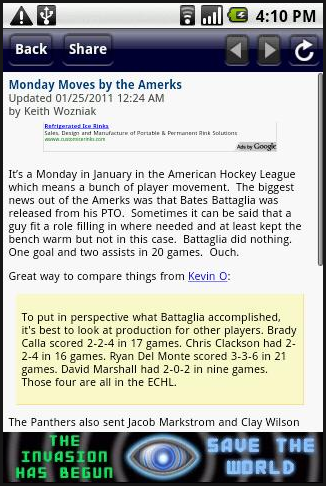 There’s also a couple of American Hockey League applications that I’d recommend down below. * I haven’t tested on a Blackberry in some time, if there’s any issues click on the Contact link above to leave me feedback!